It’s been another good week on the team front for Dundalk Golf Club as two teams took big steps towards Leinster pennants at the expense of Headfort Golf Club. 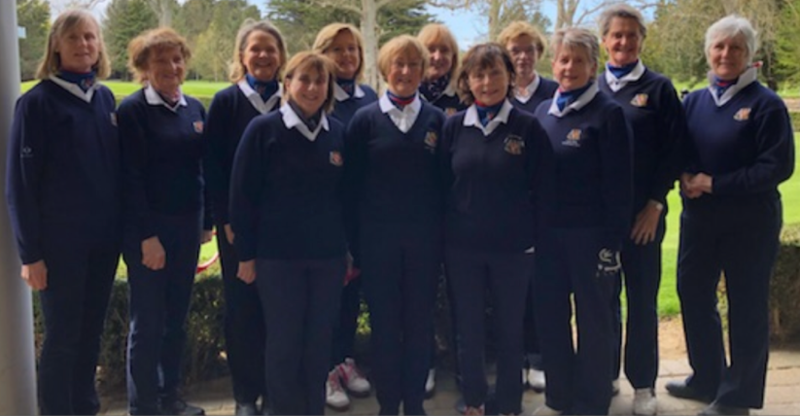 The men’s All-Ireland Fourball Team and the ladies’ Mary McKenna Diamond Trophy team have both reached the Leinster quarter-finals of their respective competitions after tough matches against their opponents from Meath. The ladies produced a superb performance last Wednesday when they went to Kells and beat the home club 4-1 to advance to a last eight meeting with The Island, who defeated the reigning national and provincial champions, Royal Tara, 3-2 in their second round tie. Managed by Mags Coburn and Rita Moriarity, the ladies played some great golf and got on top early on in four of the five matches. In the top match, Elizabeth McGuinness and Briege Renaghan were three up after four holes and although the Headfort pairing responded down the back nine and closed the gap to one hole with two to play, the Dundalk pairing held on win by one hole. That match produced the winning point because Maureen Sheridan & Gerardine Blackmore had closed out their match on the 17th for a 2&1 win having got a firm grip on it when they went two up on the 15th. Mary Hession and Siobhan Duffy put the first Dundalk point on the board with an impressive performance that saw them go five up after eight holes and they eventually ended it on the 15th to record a 4&3 win. The other pairings of Anne Murray and Mary Dooley, and Theresa Smyth and Oonagh Quinn, were both well in the hunt for victory when their matches were called in. Having been drawn away to Donabate and Headfort in the opening two rounds, Dundalk will now have home advantage later this month when they face The Island for a place in the Leinster semi-finals. The men’s All-Ireland Fourball team, under the management of Frank Byrne and Larry Soraghan, beat Headfort 3-2 last Saturday in a contest that saw all five matches decided on the 17th hole. Play began in the three away matches at Headfort at 9.30am as Dundalk went in search of an away point to ensure the two home matches in Blackrock, which didn’t tee-off until 12.45pm, would determine the overall outcome. In the top match Eamonn McEneaney and Michael Begley lost 2&1 despite returning a betterball score in excess of 40pts. Having halved seven of the opening nine holes, the pairing turned level and the home side went one up on the 11th when they hit a 200 yard shot to within inches of the hole for a birdie. A controversial ruling on the 15th paved the way for Headfort to go two up on the 15th and they held on to close it out on the 17th. In the next match Colm Garvey and Davy Cairns got off to a great start and were two up after seven but the Headfort duo came back at them and won five of the next seven holes to take a three hole lead. The Dundalk pairing won the 15th but had to settle for halves on the next two holes as the Meathmen held on for another 2&1 win. That left Kevin Carthy and Ray Pepper holding Dundalk’s fate in their hands and they were up against Headfort’s strongest pairing who had not been beaten in five years of matchplay and never taken beyond the 15th hole. However, it was soon obvious that the Meathmen hadn’t met the likes of Carthy and Pepper before as they took the lead on the second when Pepper parred. Headfort came back and were one up after 10 but then Carthy took centre stage and parred the next three holes to move Dundalk in a two hole lead with five to play. Headfort won the 14th but Pepper parred the 15th to restore the two hole advantage and, after halving the 16th, the Dundalk pairing took the 17th with a par from Carthy to record a 3&1 win. That left Dundalk trailing 2-1 but with the two home matches still to be decided. In the top match match Peter O’Brien and Dermot McKenna found themselves one down immediately after losing the opening hole and then went two down after four before pars at the fifth and sixth brought their match back to all square. The Dundalk pairing eventually took the lead on the ninth with a birdie and went two up on the tenth with par. Headfort won the 12th but Dundalk took the 13th to restore the two hole advantage. The away team then won the 15th with a par to reduce the deficit to one with three to play but after 16 was halved in fives, Dundalk closed out the match on the 17th when McKenna sank a short putt for the hole and a 2&1 win. Behind them Adrian Kenny and Gerry McDermott were never behind but they were made to fight all the way by their dogged opponents. The Dundalk duo won the second and third to open a two hole lead but then lost the fifth to a par and the sixth to a birdie as the match returned to all square. Headfort then missed a glorious opportunity to take the lead on the seventh when they three putted from 15th feet and they were left to rue that miss two holes later when Kenny rolled in a short biride putt after a magnificent seven iron tee shot. Dundalk moved two holes clear on the 12th when McDermott holed a breaking downhill putt from 30 feet and a par at the next saw them take a three hole lead. Wayward teeshots at the 14th allowed Headfort take the hole and reduce the gap to two but Kenny and McDermott then halved the next three holes to win 2&1 and secure the winning point for Dundalk. In the Leinster quarter-finals, Dundalk will have home advantage against either Donabate or Malahide. This weekend will see Dundalk Golf Club host a qualifying round in the AIG Junior Cup with nine clubs, including Dundalk, teeing it up in qualifying on Saturday with the top two qualifiers advancing to the matchplay final on Sunday morning.